After three years of talking about it and studying the pros and cons, San Jose police officers started rolling out new body-worn cameras. On Wednesday, 21 officers wrapped up the required class needed to use the new body-worn cameras that will eventually be standard equipment for nearly the entire force. "Now we're going to have an environment where when individuals have contact with police, and their perception differs from what the police department says occurred," San Jose Police Chief Eddie Garcia said. "We're going to know what is the truth as best we can." The training at the police academy facility focused on operation, maintenance, as well as when the cameras would be turned on. Officer must turn on the cameras for active confrontrations, but can be shut off for private conversations and strip searches. Activists see the move as a step in the right direction. "I think it's long overdue. I think it's a welcomed measure," Shaunn Cartwright said. Starting last summer, they began testing two kinds: The kind that attach to an officer's glasses, and a small box worn on the chest. The department ultimately chose the latter, created by Taser. The city council voted in May to spend $4 million on the cameras for 963 officers over five years. The hope, the city staff said in its recommendation to buy the cameras, is to "improve policing and provide a safer community." There had been initial stalling from the police union on the matter over storage capability and privacy rights, but eventually the city and the union agreed to a compromise. After two years of talking about it and studying the pros and cons, San Jose police officers on Wednesday debuted body-worn cameras. Kris Sanchez reports. The decision to wear the cameras has long been hailed by police observers like retired judge and San Jose Independent Police Auditor, LaDoris Cordell, who told NBC Bay Area in a previous interview: “For the public to have any trust in this body-worn camera program in San Jose, it cannot have provisions that allow such subjectivity and give that complete discretion to a police officer." 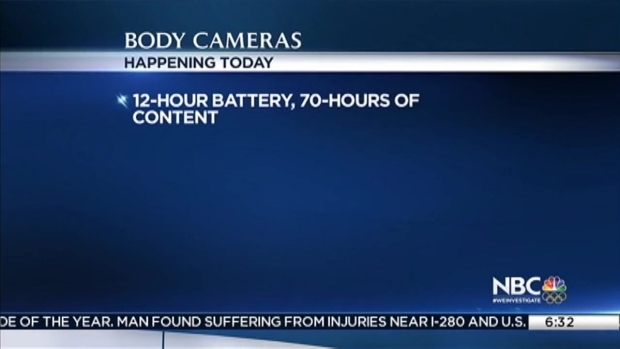 These cameras have a 12-hour battery life and can hold 70 hours of content. The rules dictate that San Jose police must use the cameras for active confrontations, but can turn them off for private conversations and strip searches. Cartwright feels the policy doesn't go far enough. "I think there's a little bit of it that's half-hearted because it should be worn every minute of every day," she said. "They shouldn't have access to the cameras to turn them off or turn them on. They shouldn't have a chance to review them. Because if they really were about transparency, these are the things that they would do." The Investigative Unit analyzed several police departments in the Bay Area, and found that most officers who employ the technology also track how often they are used. Oakland did not track body camera use, until the Unit began questioning the department about it. Officers must notify private citizens they are recording when entering a private residence based upon consent. Otherwise, officers are strongly encouraged to inform members of the public they’re recording. With the exception of certain types of officer-involved incidents, such as use-of-force incidents, officers and supervisors may view the footage for the purposes of report writing, follow-up, courtroom testimony, or for the purposes of an administrative interview. Also, Internal Affairs may view the files for administrative investigations. All recordings are subject to discovery under the Public Records Act. Like 911 calls, they are considered records of investigation. The San Jose Police Department has set up a website on body cameras, including the policy manual that officers must adhere to, and an opinion section for the public to comment.